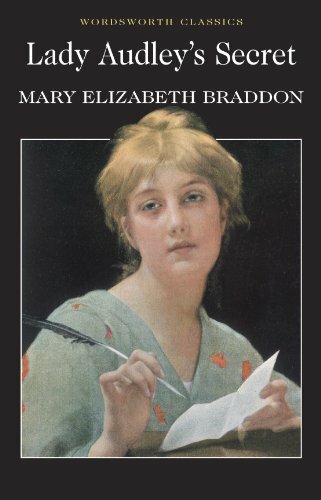 It's been a while since I read a classic, but of the many classics out there, why pick up Lady Audley's Secret, a book by an author that I had never heard of in my life? Well, the blurb promised all sorts of scandalous acts that shouldn't come anywhere near the neutered Victorian ideal, so of course my interest was peaked. After three years spent gold prospecting in Australia, George Talboys is keen to return home to his beautiful wife and young child. Upon his return, he finds that she has just died and, utterly bereft at this turn of events, he stays with an old friend to try and recover. His friend, Robert Audley, suggests a visit to his wealthy uncle in the Essex countryside as a form of distraction and as an excuse to meet his new aunt, a woman renowned in the local area as a great beauty. When the trip ends with George's disappearance, Robert finds himself driven to discovering what happened. The more he investigates though, the more suspicious his new aunt becomes, and he risks miring his family in scandal. You probably noticed that I didn't mention any of the scandalous things that the blurb tempted me in with. Because knowing them in advance kind of ruins any surprise that Lady Audley's Secret has. Lady Audley, in my read-through, had no real secrets because with a couple of exceptions the twists are pretty clearly signposted if you've already been told the spoilers. Despite this though, I found this thoroughly enjoyable. The writing is a bit on the flowery side, but considering the focus on Victorian domestic arrangements it does work quite well. The only thing that truly bothered me was the ending. If you're interested in actually reading Lady Audley's Secret, which I really would recommend, then you might want to skip the next paragraph. So, the ending. Lady Audley has been revealed to be a murderous bigamist who pushed her first husband, George Talboys, down a well after he discovered that she wasn't dead as he had first believed. In order to save his family's honour, Robert Audley spirits her away to a madhouse to quietly expire at a safe distance, but can never honour his departed friend by giving him a proper burial for fear that it would go to a criminal court. All well and good so far, and I could have accepted that as an ending. Then it turned out that George Talboys was alive all this time and just doesn't have any understanding of how this "keeping in contact" thing works. And everyone who isn't the eponymous Lady Audley has a happy ending. The book ends with a reference to a Bible quote where the righteous shall not be forsaken, and honestly it's so bloody saccharine after a plot that has been gratifyingly scandalous and treacherous. It was such a disappointment. Not enough to entirely ruin the book, but enough to leave a bad taste in the mouth.